Wine is such a lovely tool in cooking, just bringing that extra richness to every dish (what’s a good Risotto without wine?) This Chilli recipe may not be authentic but it gets me through a nice cold day and has so few ingredients. 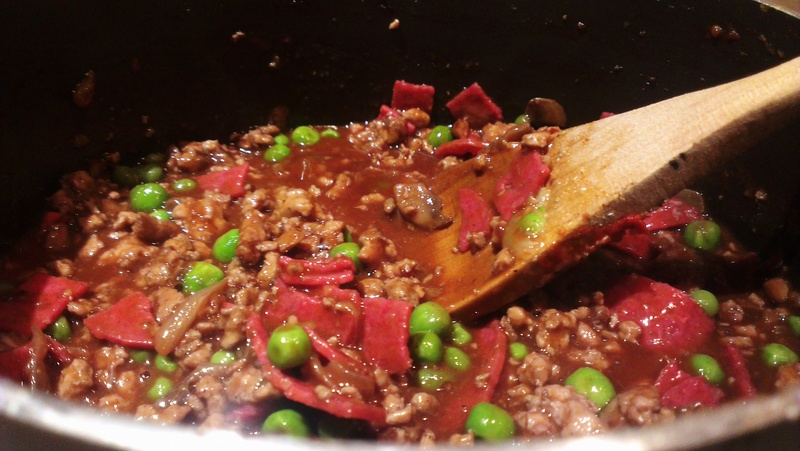 The meat you use really doesn’t matter – I’d say Beef is preferable but I was still using up some of my Turkey mince. Chop your onion and fry over a fairly high heat. If you prefer them softer add some salt. 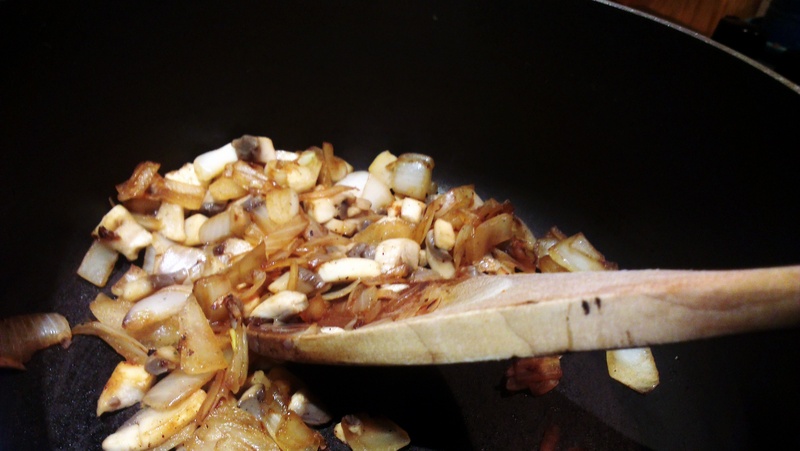 If using mushrooms or peppers add them when the onions start to brown. Cook until the water they release has evaporated. Add the mincemeat and fry until brown. For a thicker sauce, add some flour to the meat at this stage. Reduce heat and add spices and tomato puree, coating the meat. Fry for a few minutes until aromatic. Pour in the red wine until it just covers the meat. Add any other filler vegetables at this stage. Stir and simmer until the sauce thickens and loses its alcoholic taste. 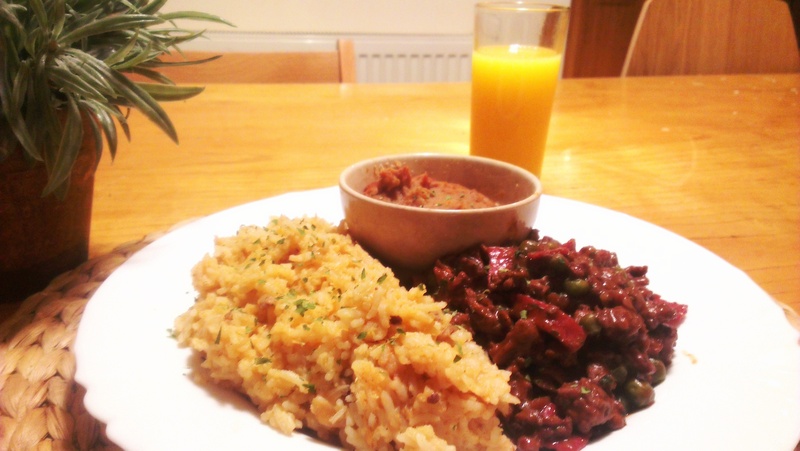 Whilst rice is the most common accompaniment for chilli, just about any carb will do. Some boiled new potatoes or noodles would also work well. I served mine with paprika rice and Refried Beans with some parsley. This will keep for a few days in a sealed container in the fridge. Would make a great next day lunch served on a Jacket Potato. Any suggestions for alternative ingredients or techniques? Let us know in the comments. Posted in Beef, Guesscipes, Mains, One Pot, PoultryTagged chilli, mexican, mincemeat, one pot, recipe, turkeyBookmark the permalink. I find the longer you cook the deeper the flavour. This does mean if you use peas or other veg it goes in later as it will just over cook. Also garlic compliments the red wine and onions.